Debra Kawaguchi and Sarah Casey Suicide Memorial - Suicide.org! Debra Kawaguchi and Sarah Casey Suicide Memorial - Suicide.org! Debra Kawaguchi and Sarah Casey Suicide Memorial - Suicide.org! Debra Kawaguchi and Sarah Casey, both 13, from Knox, Indiana, were beautiful, intelligent, and popular 8th graders at Knox Middle School. On August 28, 2004, Debra and Sarah died by suicide by walking in front of a train together. 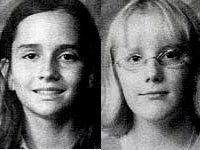 Debra and Sarah are deeply missed by their friends and families; they were very special young girls. Debra will be remembered as a young girl with a passion for writing. She loved to develop characters and see them come to life in her words; and she also enjoyed reading novels, which helped her with her writing skills. Debra also had numerous other interests. She was an excellent artist, and she loved to draw. And she was a diligent student of Japanese culture -- she wanted to learn as much as possible about her heritage. She even started to teach herself Japanese. And on her first day of school this year, she wore a traditional Japanese outfit. Debra was an extremely intelligent and talented girl, and her parents, Robert and Teresa, deeply miss her. Sarah will be remembered as an extremely affectionate person who always wanted to help others -- she would always go out of her way to help a friend in need. Sarah had many interests, including a passionate interest in old cars, and she was amazingly knowledgable about classic cars at only 13 years old! She also loved motorcycles, and enjoyed riding on the back of her father's motorcycle. And she loved to ride her skateboard, and was able to perform some impressive tricks. Sarah, like Debra, was an extremely intelligent and talented girl. Brian Casey, Sarah's dad, and his former wife, Pamela Bodine, miss her very much. Debra Kawaguchi and Sarah Casey were very special, indeed. And now they are angels. We miss you Debra and Sarah.